This breakfast recipe is any meal-prepper’s dream. It’s super simple and delicious and requires only a few ingredients. The tomatoes provide a good source of the antioxidant lycopene when cooked, while the eggs provide necessary protein, omega 3s and sulfur. The final product is sturdy and travels well, making it ideal for a breakfast on the go or a quick mid-morning snack. They are also a fun and easy idea for entertaining and can be made relatively quickly and in large batches for your next big brunch! Preheat the oven to 400 degrees. Slice the tomatoes in half and carefully scoop out the seeds and center portion. Reserve this part for soups or sauces. 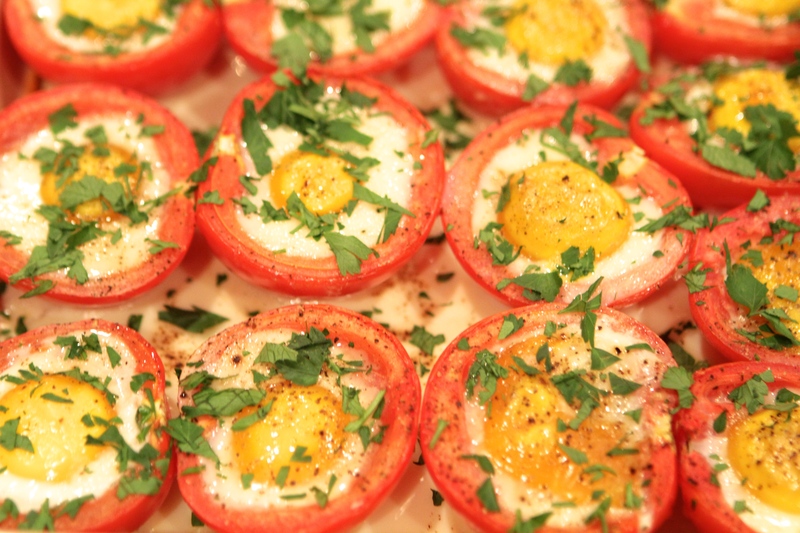 In a ramekin, crack the eggs one at a time, then carefully slip into the scooped out part of each tomato. Season with salt and pepper and place on a rimmed baking sheet. Bake for 7-8 minutes or until whites are set and yolks are still slightly runny. Top with fresh herbs.